Indianapolis, Indiana, July 2, 2012: Both homeowners and lawn care operators can, and should work together to prepare drought stressed properties for maximum recovery this fall. This word comes from Bob Andrews, Executive Director of the Indiana Professional Lawn and Landscape Association. From Indianapolis to Evansville, drought conditions are worse than the previously reported dry weather of 1988. All of Indiana has been adversely affected. According to Andrews, caring for your lawn is not business as usual. Lawns and landscapes each require some attention if they are to recover uniformly this fall. 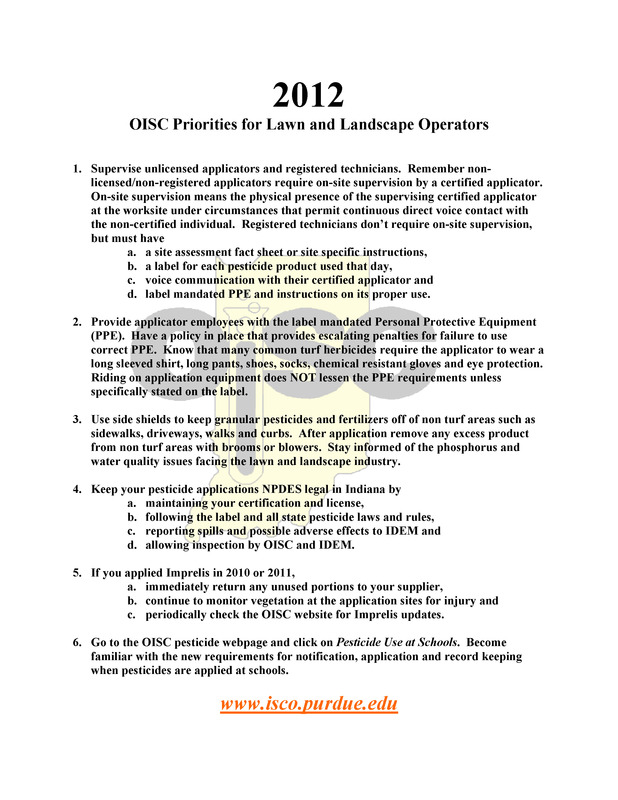 Your Indiana Professional Lawn & Landscape Members list some helpful hints. 1. No matter what you read or hear, lawn grass does not go into dormancy and then automatically come back. Most lawns in Indiana are made up of Kentucky Bluegrass and will begin to die if left without any moisture for six to seven weeks. This problem is exasperated by high temperatures. Thus some water is required. 2. During drought, water the lawn deeply once or twice a week. Watering once a week for 40 minutes in each sprinkler location will go a long way towards keeping the lawn’s root system alive. 3. Concentrate watering on sodded sections of your lawn, high traffic areas, or areas that receive little or no shade. 4. Water very early in the morning if at all possible. During drought conditions, you can also water at night or when pressure is at its highest. 5. Do not mow the lawn unless it is absolutely required. Cutting it too frequently, or at too low a level, removes much needed leaf blades which act to retain what moisture is available. 6. Maintain some fertility. All fertilizers are not the same and your lawn care professional will work with you to provide the lawn with a slow release type of fertilizer in order to provide the plant with proper nutrients during periods of stressful weather. “High heat and drought changes the rules of how we need to deal with a growing plant” says Andrews. "Working with your local lawn care professional is the best way to see to it that your lawn and landscapes recover to their maximum potential this fall." The Regional Workshops are set for the the month of February 2012. The above document is often requested from the OISC office and staff. Thanks to Joe Becovitz for making this available to us! 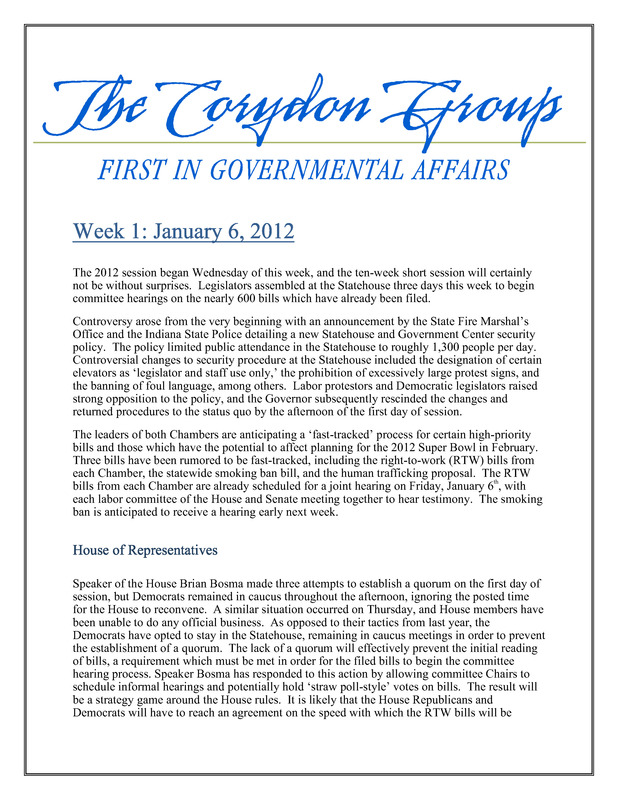 UPCOMING EVENTS IN 2012: As you prepare for next season, also prepare to attend our annual series of Educational Programs. More information about these events will be forthcoming as we move into next year.. 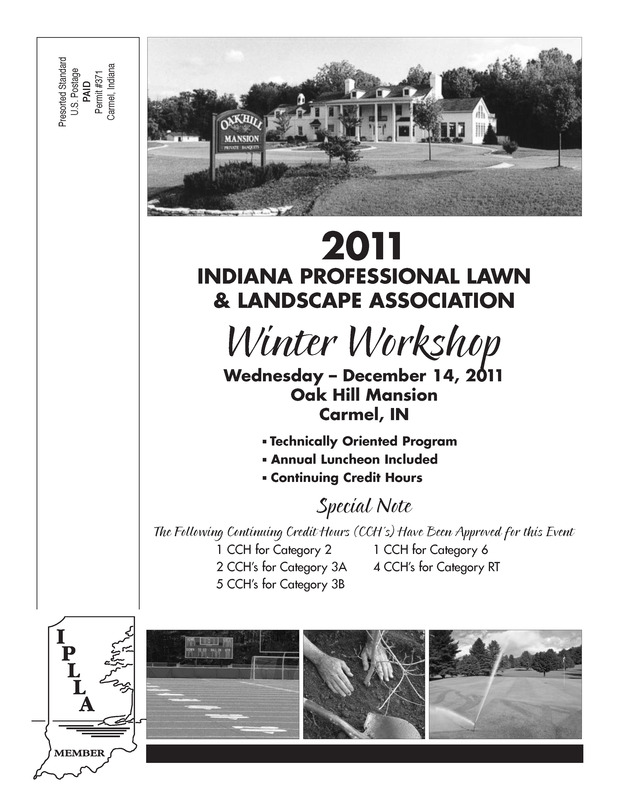 The Winter Workshop will be held on December 14, 2011 at The Mansion at Oakhill in Carmel, Ind. Past updates can viewed in our BLOG. We wanted to remind all IPLLA Members that this week we will be mailing registration information on our 2011 Winter Workshop which will be held on December 14h at Oak Hill Mansion in Carmel. This will be a very timely education program and a great way to round out the year. You can get more information on this program and register online at www.iplla.com. Special Note: In the next week, those of you with Pesticide Applicator licenses will be receiving your annual renewals from The Office of Indiana State Chemist. Please read them carefully to be sure that you have the required number of Continuing Credit Hours going into the end of the year. The IPLLA Winter Workshop offers such credits in Category 2, Category 3A, Category 3B, Category 6, and Registered Technician. Thank you to all who helped make the IPLLA's 25th Annual Summer Field Day A Success! The Winter Workshop will be held on December 14, 2011 at the Oakhill Mansion in Carmel. Details will be posted and mailed out soon! Hoosier Lawn Care Operators, golf courses, and suppliers are now well into the third month of the unfolding story of Imprelis herbicide. In that time, we have learned of significant damage caused to conifers, not only in Indiana, but in as many as 21 other states. We do know that the damage to such trees was severe. We know that the damage was caused, in most cases, by only one low-rate application of the herbicide to the turf grass surrounding those trees. We know that reaction in Indiana was swift and certainly in the best interests of those affected. The Office of Indiana State Chemist literally dropped everything they were doing in order to respond to complaints and questions regarding the use of Imprelis. We know that their investigators spent week after week following through on such complaints to end up documenting that the damage was not caused by the applicator; but by a mis-branded product. We know that Purdue Extension made great efforts to keep the industry informed as to what was happening, and what we were learning about the unfolding event. We know that the Purdue Plant & Pest Diagnostic Lab worked tirelessly to process sample after sample to document that affected plants had not been damaged by disease or insect infestation. We also now know that DuPont has taken full responsibility for what happened and has initiated a program to recall any product still in the field. We know that the EPA and the Indiana State Chemist have stopped sale, use, or distribution of Imprelis. We also know that the manufacturer has begun a claims processing program, with guidelines, so that affected property owners can be made whole as a result of damaged caused. All this we know and have learned in about 110 days since early June. The learning curve has been steep. However, what we don’t know may soon replace the impact of what we do know about Imprelis damage, and what is being done to correct it. The bigger, long term question is WHY? Why did certain varieties of trees react so strongly to one application of a turf grass herbicide? What did, or did not happen in the development and testing of Imprelis which may have prevented this disaster? Did someone not do their homework? Did someone else not properly grade their papers? Was research not thorough enough, or in depth enough, to catch the fact that this product was highly toxic to certain trees at very low rates and after only one application? If a pesticide is labeled for use on turf grass, is the manufacturer not required to test its potential impact on other non-target plants which are indigenous to such areas as a residential lawn or a golf course? Would not such plants as evergreen trees fall into that category? From talking to friends in the manufacturing sector, and from reading all that was published about Imprelis before its introduction--we’ve learned that an enormous amount of money goes into the development of such products before they even get close to registration. DuPont conducted over 400 independent field trials and university tests since 2006 on Imprelis. People in high place signed off on its quality, safety, and effectiveness. It was then registered for sale by the Environmental Protection Agency in 2010, heavily marketed to the industry in the winter of 2011, sold as fast as it could be produced this spring; and away we went. The cost of Imprelis will be more than the damage done to literally thousands of trees. Whether you used Imprelis or not; this incident will take a toll on our believability and on the confidence our customers have in what we bring to their property when treating their lawn. We are going to be explaining ourselves for a long, long time. And rightly so. Thus let us be clear. The story or Imprelis is long from over. We owe it ourselves, our customers, and the future of our industry to not rest until we look at the system of product development, testing, and registration; in order to find any weaknesses in that process, and then fix them to the best of our ability. If we do so, then we can again be more accepting of new products and perhaps the story of Imprelis will have a productive ending. Registration information for the August 25th Field Day is now posted on line at IPLLA.COM and informational booklets were mailed on July 5th. Once you see the entire educational program, I hope you will find something of interest for everyone involved in your operation. 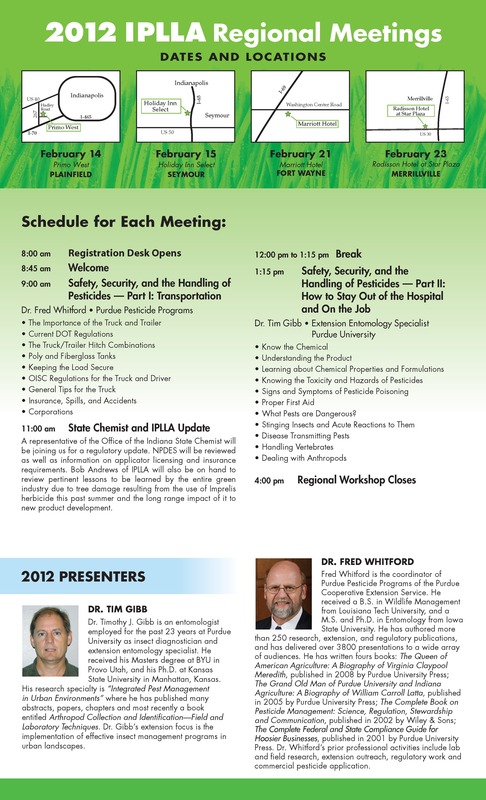 As IPLLA grows, we certainly understand our responsibility to bring you the very best and very latest in green industry education. Plan on joining us for the 25th Annual Field Day. I’ll look forward to seeing you. In response to the many concerns raised by members regarding the damage caused to certain trees by the DuPont herbicide Imprelis, we have organized a special one hour panel discussion to address the issue at our upcoming Summer Field Day on August 25th. Our panel will include representatives from the Office of the Indiana State Chemist including David Scott, Pesticide Administrator, as well as representatives from Purdue’s Department of Agronomy, and the Plant and Pesticide Diagnostic Lab. This panel discussion will be held beginning at 3:30pm in Hall A of the Hendricks County 4-H Conference Center and will work to bring us all up-to-date on this ever changing story. 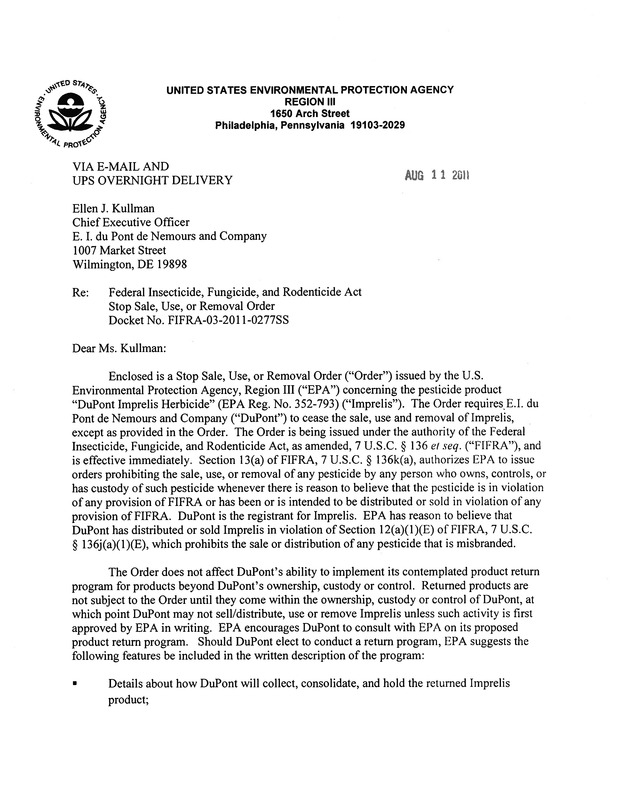 As many of you already know, the United States Environmental Agency issued a Stop Sale Order on Imprelis effective Thursday August 11, 2011 (in sidebar at the left) in response to thousands of reports of tree damage caused by application of the product to turf. Whether you did, or did not use Imprelis, the implications of this historic event in our industry; will undoubtedly be felt for many years to come. The panel discussion will be open to attendance by any firm registered for the IPLLA Summer Field Day. I urge you to join us that day. The ongoing and developing story surrounding DuPont’s herbicide Imprelis has prompted a number of questions to IPLLA regarding liability insurance and who indeed is responsible for the damage incurred from the use of this product. Let me try and answer some of those questions after consulting with Scott McGinness of Gregory & Appel Insurance in Indianapolis. These answers hold true for any pesticide and for any commercial applicator. As a licensed applicator company, you are required to carry insurance for a claim which entails damage that results from an indirect chemical application. This is called a Herbicide and Pesticide Applicator Endorsement and its inclusion, in your liability policy, is required as a condition of licensing by the Office of the Indiana State Chemist. Commercial applicators need to be properly licensed by the Indiana State Chemist in order for their insurance agent to respond to any such damage claims. That is one of the conditions of the endorsement. If you are not properly licensed at the time damage happened, then you cannot expect any coverage. Most policies contain a deductible and $500 is a common number. This means per occurrence which usually is translated into “per application”. Thus, the deductible would apply to each and every occurrence or application..
IPLLA members are urged to put their insurance agent on notice if you suspect that your use of Imprelis may result in a claim. The more your agent knows, and the sooner they know it, may help you a good deal in the long run. Even if you did not use Imprelis, this incident is good cause to check with your agent to see that you are properly covered if a similar issue raises its ugly head in the future. Mr. McGinness and his firm will be on hand at the August 25th Summer Field Day to help answer any questions you might have. I want to emphasize that all involved fully expect DuPont to repair and replace what they must do in order to rectify the damage caused. It is not a good idea to remove damaged trees right now, or to immediately file a claim with your insurance company. If you have filed suspected damage notices with the State Chemist, and with DuPont, then you have done what you should be doing at this stage in this ever changing story. We’ll continue to do our best to stay on top of the story. Attached at left are two documents which you will be seeing more of in the coming days. 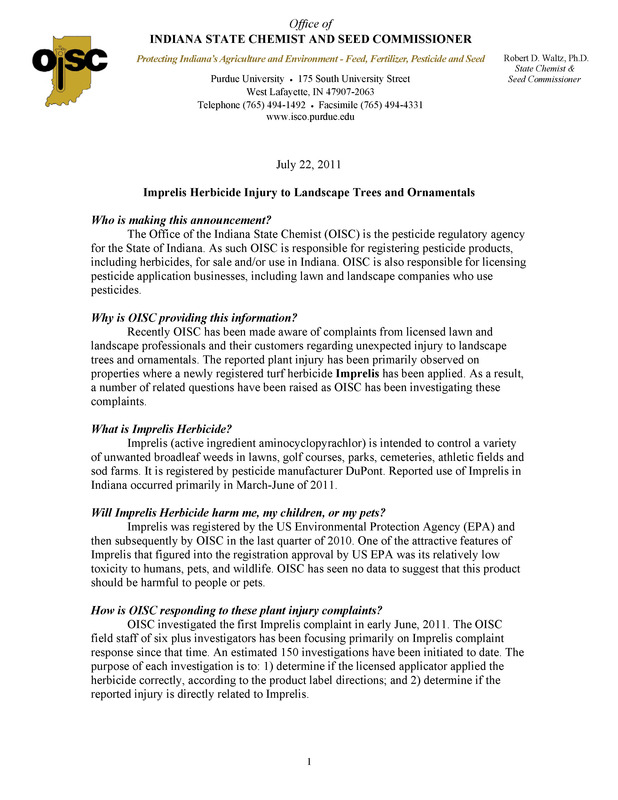 The first is a statement issued by the Office of Indiana State Chemist entitled “Imprelis Herbicide Damage to Landscape Trees and Ornamentals”. 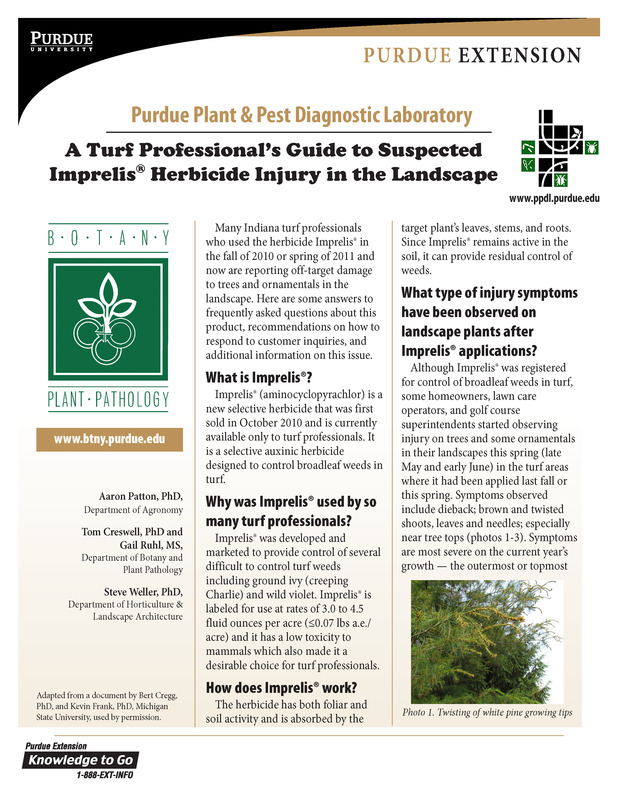 The second is a publication from Purdue University Extension entitled “A Turf Professional’s Guide to Suspected Imprelis Herbicide Injury in the Landscape”. Both of these are well written and I appreciate the specific efforts of Mr. Dave Scott of OISC and Dr. Aaron Patton of Purdue in making them available to IPLLA Members. I would encourage you to make them available to any of your customers who may have suspected Imprelis damage to trees or ornamentals. Both documents are self explanatory and we’ll not use this issue of IPLLA News to further try and explain what they already say. I do want to encourage those members who may be experiencing customer calls regarding Imprelis damage to do several things that will help the process move forward. If you used Imprelis this spring, and do suspect damage to a customer’s trees or ornamentals then you should establish a claim with DuPont. This can be done by calling 1-866-796-4783 and speaking directly with a Customer Service Representative. They then should assign your firm a reference number. The Office of Indiana State Chemist is asking that you NOT report every instance of suspected Imprelis injury to their office. The OISC is instead asking that you file a complaint with them only in those instances where (1) you have examined the site and ruled out other possible causes of the observed injury, and (2) it appears the suspected injury may result in the death of the plant(s), and (3) the injured plant(s) are not already dead, and (4) your customer has been made aware that the OISC will visit their property in order to take photographs and obtain samples related to their complaint. At present, virtually every expert involved in this matter is recommending four courses of action for potentially affected trees. 1. Do not remove them for a full year. 4. Encourage the customer to slowly water the base of each affected tree for 30 to 40 minutes each week. It is safe for me to say that the Imprelis issue will be with us for a long time to come and IPLLA will be there to help keep you informed and current on this ever changing and very unfortunate event. We have been doing our best to keep every member up-to-date on the unfolding story surrounding the DuPont herbicide Imprelis and its apparent impact on White Pines and varieties of Spruce Trees in Indiana and other states. Here is some current information. While there are differing opinions, most experts agree that affected trees should not be cut down or immediately trimmed back. Fertilization of affected trees should not be done now as no one is sure how fertilization would encourage further root uptake of the herbicide. However, fall fertilization should definitely be considered as a part of any treatment program. Suspected damage should be immediately reported to the Office of Indiana State Chemist. As everyone involved hustles to cover their backsides, your records on suspected damage should be thorough and kept well documented. I have also been asked whether or not we should continue to use Imprelis on wide open properties like athletic fields or on lawns with hard to control weeds such as Wild Violet. While I can’t answer that question for you, our firm has decided to cease any use whatsoever of Imprelis until this matter is satisfied to our satisfaction. I cannot stress enough that we are in new territory here. The more experts I talk to, the clearer it becomes that there is no clarity! Simply put, no one really knows what happened here, why it happened, and what is the potential recovery for the trees affected? One thing is clear. Whether you used Imprelis or not, the progression of this story will be one of the great learning experiences for all of us involved in any way in the turf industry. At present, that learning curve is pretty steep.